Our Barrel Select Pinot noir is our most diverse and complex blend of 100 percent Pinot noir from our Estate Vineyard, and multiple vineyard sites throughout the Willamette Valley. Our winemaking team "tunes" and "tweaks" various trial blends comprised of percentage-wise mixes from over 100 barrels hand-picked from our cellarbefore arriving at each year's decision for the Barrel Select blend. 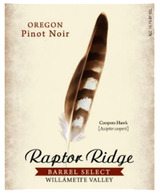 Our intent with this wine is to craft a modestly-priced, excellent Pinot noir that is expressive of Oregon's Willamette Valley.